There is no need to speak about the risks of motorcycling. Not only is it inherently dangerous given the little protection it provides, but you’re also constantly exposed to the elements with all that that entails. Nonetheless, that only makes the experience even more thrilling and rewarding. As such, a compact motorcycle First Aid Kit (FAK), and the skills to use it, should be a must-have in any rider’s kit. 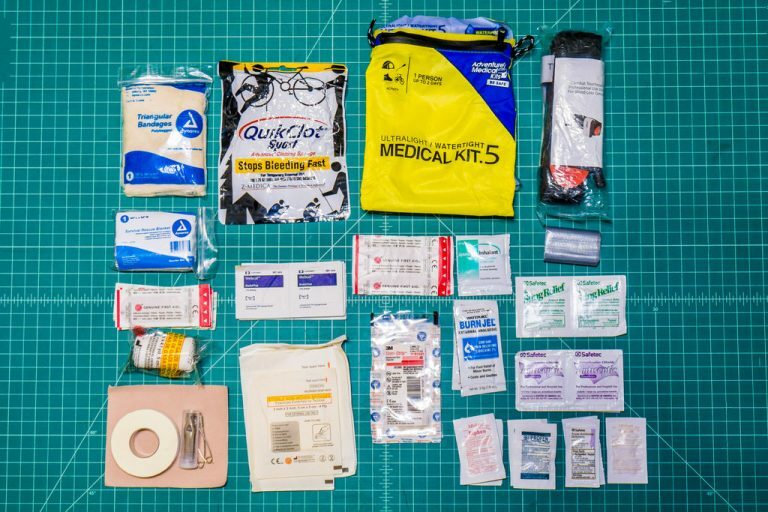 Here I’m going to detail what I carry in my comprehensive First Aid Kit as inspiration for anyone else – As well as some tips. If you have any recommendations or suggestions of your own, I’d be happy to hear about them, too! But first, the prelude. The first step is to make a distinction between Comfort-Oriented First Aid Kits and Life-Saving First Aid Kits. 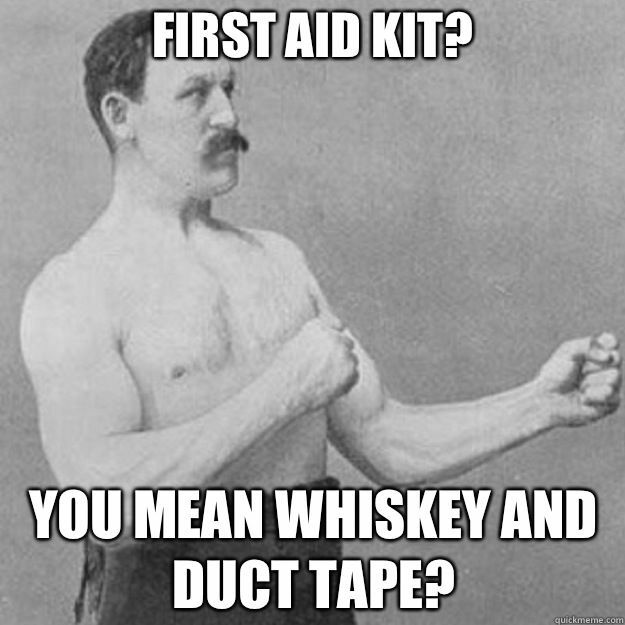 Any good first aid kit should be a combination of both. These are the type of first aid kit you’ll typically find in most people’s cars. Or down the aisle of your supermarket. They won’t save your life, but they may very well save your sanity – at least if your child starts to feel under the weather on day one of Disneyland. While they won’t take care of (almost) any life-threatening issue, they’re important because they are what makes a FAK (First Aid Kit) useful enough to bother carrying around routinely. Better known as EPIKs (Emergency Personal Injury Kit), Blowout Kits, Trauma Kits, Tactical FAK’s, and others. These are the type of FAK most people never need to use in their lifetime, but when needed, they are literally the difference between life and death. I think they are a worthwhile piece of gear for anybody, but for the motorcycling crowd this is even more essential. The need to strike a balance between both variants is why no off-the-shelf First Aid Kit is ideal for virtually anyone. 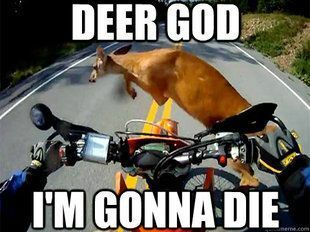 Much less a motorcyclist. Many are either one or the other. And if you find a kit that is the combination of both, it’s either huge or it’s overpriced. You will have to decide for yourself what components you will actually be using in real life, and combine that with the life-saving items you know how to use. That’s how you should put together your motorcycle First Aid Kit. All in a package and with a weight you’d be willing to carry around in your backpack or bike. I really want to emphasize this – the key is to strike a balance. There is no point in only carrying around a tourniquet that you’ll never use, nor does it make sense to only carry band-aids and antiseptic wipes that will barely manage a paper-cut. When you properly equip your motorcycle First Aid Kit, it should be compact enough to carry around 99% of the time and accessible enough to not be so much of a hassle you’ll never bother with it. That besides containing components you will actually use (and know how to use), including some that could save your life. These are no small demands. You also have to ask yourself what your goal is, taking into account your riding style and environments. In my case it’s taking care of most common issues on the spot, definitively and properly. If you adequately clean and prep a wound, apply some benzoin tincture and Steri-Strips, then wrap; you can take care of many casual “deep” cuts just as well as many clinics would. If all you have is 10 ml of saline solution and some generic butterfly bandages, you might as well have left your FAK at home since it isn’t going to save you from cutting your trip short. Sometimes it’s worth it to go the extra mile just to make the first few miles justify the effort. Also worth mentioning is that even if you trust yourself not to need it, what about your GF/BF, friend, coworker, etc? I’ll be honest, I don’t really recall ever needing to use my First Aid Kit on myself. But it sure feels good to be the hero and have the knowledge and tools to take care of the issue when a friend has an accident. And it happens pretty often. That said, let’s go on to the meat of the subject. This is the vast majority of my motorcycle First Aid Kit Components. The tourniquet aside, it all fits in the yellow bag. This is just a list of what I carry. You should feel free to add, remove, or substitute anything that better suits your needs and skill level. 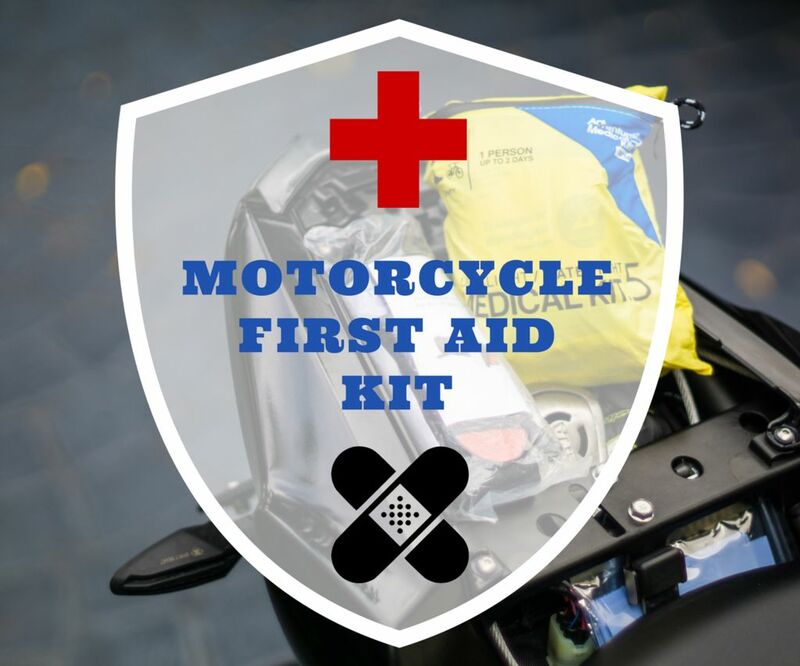 The most important step when putting together a motorcycle First Aid Kit is choosing its container. This will dictate how much you can put in it, where you can store it, and how convenient and organized everything is. 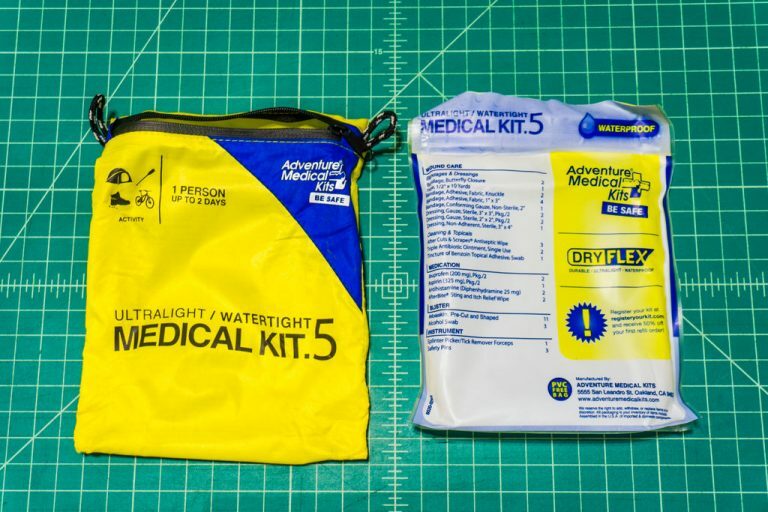 I personally love the Adventure Medical Kits Ultralight & Watertight .5 First Aid Kit. It’s an excellent First Aid Kit by its own merits, even without supplementing it. Besides that it’s extremely lightweight, compact, and water-resistant. There are no organization features to speak of, but that’s just inherent with the footprint. This will be the starting point. The following components are a combination of the Adventure Medical .5 First Aid Kit and components of my own choice. Components marked with a ‘*’ come included with the .5 kit. This is the bag I use to contain my kit. It’s rugged, compact and waterproof. Perfect for a motorcycle. *4x Adhesive Fabric Bandages, 1″ x 3″ – Your typical “Band-Aid”. A staple in any First Aid Kit. 2-4x Extra-Long Finger Band-Aids – This is actually the most used item in my motorcycle First Aid kit. They are extra-long and truly waterproof, so they really do stay in place when you use them. *1-2x Adhesive Knuckle Bandages – Shaped to adhere properly and comfortably to knuckles. *1x 2″ Conforming Gauze Bandage – To wrap wounds. *2x Sterile Gauze Dressing, 2″ x 2″ – To dress small, superficial wounds before wrapping. *2x Sterile Gauze Dressing, 3″ x 3″ – To dress larger wounds before wrapping. *1x Non-Adherent Sterile Dressing, 3″ x 4″ – To dress wounds before wrapping, where it is likely that the scab or wound might otherwise stick to the dressing. 3-6x 3M SteriStrip Closures – To keep lacerations (cuts) closed as a short-term alternative to stitches. I like replacing the closures that come with most First Aid Kits, which are typically junk. These stay in place much better. 1x Mini Roll of 3″ Stretch Wrap Bandage – To wrap over bandages. Just make your own mini roll from cheap “normal” rolls (see the picture below). 1x Cravat or Triangular Bandage – Useful for slings, immobilization, compression and plenty of other purposes. *1x Moleskin – Used to cover or relieve pressure on sensitive skin, such as (foot) blisters. 2-3x Burn Gel Packages – The second most used component of a motorcycle First Aid Kit. It’s an antiseptic which also provides pain relief (2% Lidocaine). I’ve forgotten how many exhaust burns I’ve treated over the years. *1-2x Afterbite Wipes – Used for immediate short-term relief of insect bites, minor burns, scrapes and scratches. If swelling occurs, discontinue. *2-3x Diphenhydramine 25 mg – An Antihistamine for allergy symptoms relief. It can also be used to treat motion sickness and insomnia. Super versatile and staple first aid kit component. *2-3x Aspirin 2×325 mg – Used to treat pain, fever and inflammation. Also used to treat and prevent heart attacks, strokes and chest pain. May present blood thinning issues, which is both a pro (strokes) or a con (bleeding) depending on the injury. *2-3x Ibuprofen 2×200 mg Packets – NSAID used for fever, pain or inflammation. 1-2x Ammonia Inhalant – Useful for fainting (syncope). But given how stimulant it is, it’s great if you’re feeling sleepy, or want to prank a friend while they’re sleeping (don’t). You simply smell the vapor which triggers an increase in heat rate, blood pressure and brain activity. Fun stuff. 2-3x Diotame – Once you’re this committed to building a motorcycle First Aid Kit, might as well toss this in, too. Another multi-purpose medication, you can use it to relieve indigestion, upset stomach, temporary heartburn, diarrhea and/or nausea. If you’re primarily concerned with antacids, you might prefer Calcium Carbonate chewables instead. On the other hand, if traveler’s diarrhea is the risk factor, check out Diamode tablets. *2x Antiseptic Wipes – Hand cleaning wipes. It’s non-essential and can be substituted by more alcohol wipes once spent. *2x Alcohol Wipes – To clean utensils, hands and the area around a wound. Do not apply to an open wound as it stings and can impede healing. It’s quickly evaporating and residue-free. You can also use it for fire starting. *1x Adhesive Tape Mini Roll, 1/2″ x 10 Yd (Micropore) – To secure bandages. *2x Benzoin Tincture or Skintac – This makes adhesive bandages stick longer and decreases irritation. While I prefer benzoin tincture, Skintac is more compact as a wipe. They’re great for butterfly closures or strips. *2-3x Triple Antibiotic Ointment Packets – This prevents infections on minor cuts, scrapes or burns. Do not use it in deep wounds. Another motorcycle First Aid Kit must-have. 2-3x PVP Iodine Wipes – It’s my favorite antiseptic and topical antibiotic, as you can apply it to open wounds and it does not sting. But it will leave stains (along with residual antiseptic effects). BZK Pads are a non-staining alternative. 2-3x WoundSeal Hemostatic Powder Packages – I love this stuff. When you need to quickly stop bleeding that a band-aid can’t take care of, just pour this on top and apply pressure to stop the bleeding. It congeals the blood almost instantly. 1x QuikClot – WoundSeal’s bigger brother. This item is designed to stop severe traumatic bleeding. It’s especially useful where a tourniquet isn’t appropriate but mere compression isn’t stopping the bleeding. 1x Tourniquet – Oh the tourniquet. What a misunderstood piece of gear! It’s outside of the scope of this guide to explain when to use it (and when you shouldn’t), but it is worth having given its life saving potential. Just make sure you learn enough to apply it correctly. There are more compact versions. *2x Safety Pins – To pin bandages in place. *1x Tweezers / Splinter Out – To remove splinters and ticks. Do not use it for insect stingers without training. 1x Duct Tape Mini Roll – Forget about carrying a whole roll. But you can make your own mini rolls (see pic above) just folding it over itself. It’s a must have. 1x Emergency Mylar Blanket – Also known as space blankets. These are super useful! It’s invaluable when trying to minimize heat loss during shock. But it’s also great for waterproofing gear, fixes, shelters and emergency signaling and a myriad of other uses. However, it’s a one-use only item. 1-2x Gloves – While it’s easy to ignore, any motorcycle First Aid Kit should include gloves. If you have the chance, always put on gloves. It’s important both for the victim and for you. ‘Nuff said. I made a How-To on how to fold glove compactly like in the pictures. CPR Mask – Most people don’t realize that, in the real world, the purpose of a CPR mask is mainly to keep the victim from vomiting “on” you. Yup. That’s why you need one. Mini EMT Trauma Shears/Scissors – More appropriate than a knife for first aid, besides just plain useful. A pair of trauma shears is good to have in your pack. They cut through leather and other thick materials like butter. The flat portion of the tip helps prevent damaging skin. 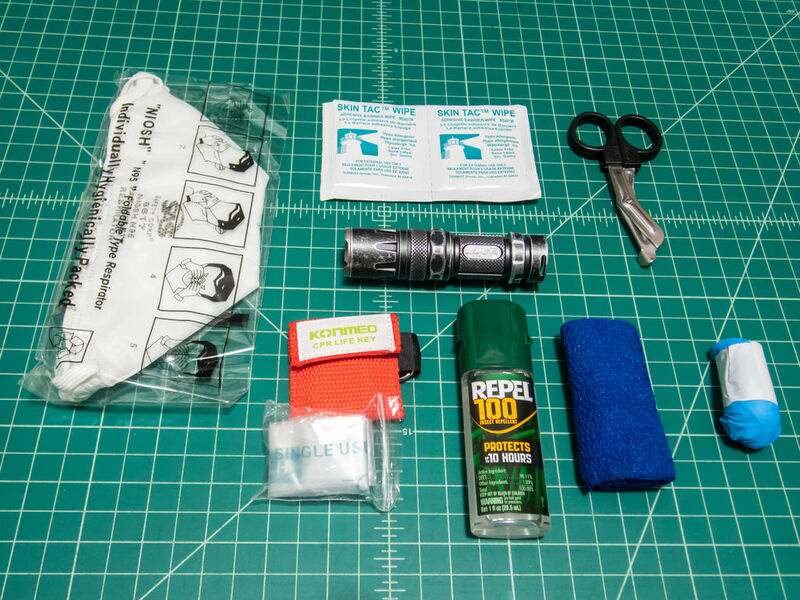 1-2x Flashlight – Not so much a First Aid component as it is just my EDC gear, but you really should be carrying one anyway. Forget about those glow sticks you bend for light, go for a real flashlight. I always carry a Nitecore SRT3 in my pocket as EDC, a backup mini flashlight under the seat, and a Utility Flashlight clipped to my backpack strap. Cus’ redundancy. They also double as road flares. Utility Tool/Knife – Like the flashlight above, it’s part of my EDC. I’ve been carrying a Leatherman Skeletool CX for around 5 years now. It’s invaluable to me considering I use it almost daily as either a knife or pliers. In an emergency it can be used to cut off gear, seat-belts, size bandages or any number of uses. A decent multi-tool of your choice is almost obligatory for any self-respecting motorcyclist. Insect Repellant – If you’re riding where you can see clouds of mosquitos (I’m looking at you, Everglades), remember to pack some. Nasopharyngeal airway – As intimidating as it looks, it’s pretty easy to use. It still brings tears to my eyes in that funny way to remember the first time I tried one on myself. Its advantage is that it doesn’t provoke gag reflex and can be used on conscious victims (typically). Just about any time CPR is needed, assuring an open airway is desirable. However, to use it you’ll need a full-face pocket CPR mask or be counting on someone arriving soon with a bag valve mask. Occlusive Chest Seals – Mainly designed for bullet wounds to the thoracic area where wound packing isn’t practical. However it can be also used for any type of perforation wound. Think branches in an off-road scenario. Or to maintain pressure over bandages. Sam Splint – These are used for makeshift splints, and can be bent to whatever shape appropriate. I actually formed it to the bottom of my main riding backpack, so it doesn’t really take up any space to carry. Sharpie – Suitable for marking on skin, such as tourniquet application time. Or for phone numbers at the bar. Sunscreen lotion – You should be covering up while riding, but nonetheless neck-burns are any motorcyclist’s trademark. It’s a pain, both to stock and restock your First Aid Kits. Not to mention expensive. 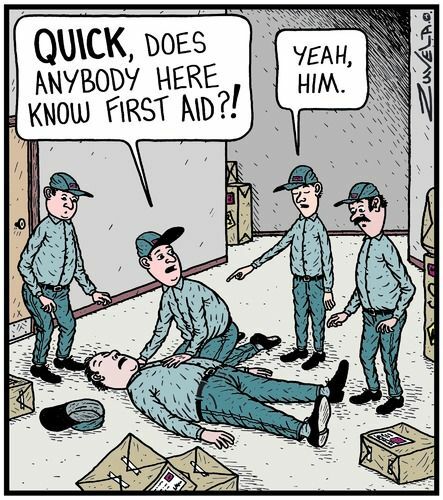 Especially considering that most people will need multiple First Aid Kits (one in the bike, one in the car, one in the wife’s car…). The absolute biggest recommendation I can make is to buy boxes of 100 (or more) individually-sealed doses instead of bottles. That way you can simply stash a few packets in each FAK. It’s much better than having to buy a whole bottle for each bag like you’d have to do if buying at your local supermarket. Individual packets are the best way to make a cheap, compact motorcycle First Aid Kit. You can also make packages yourself, but for the cost it’s simply more worthwhile to buy them pre-packeted. Not to mention sterility, dosing instructions and labeling. Compared to packaging them yourself, another benefit is that it can avoid a world of headache if law enforcement is ever dubious of the nature of those loose pills you have in zip lock baggies. Another tip, kinda related to the first, is that as long as it’s in sealed sterile packaging, it tends to stay sterile. You can find plenty of discounted QuikClot packages or other such recently-expired items on Ebay that are still perfectly good. After all, if you take a tumble on a curve, it’s not like the pavement left you a sterile wound to begin with. If you know what to look for (and what to avoid), they can be a great way to save money. What about Bite-sticks for seizures? Modern practice does not recommend their use, as they can do more harm than benefit. The current practice is to leave the patient alone in a protected environment to go through seizure. However, It may still be used as a splint or for aiding with the administration of oral glucose when placed between the cheek and gums. In either case I don’t see it important enough to carry in a motorcycle First Aid Kit. You’ll typically see this recommended for motorcycle FAK’s, and it makes me wonder if they actually practice what they preach. While there isn’t anything better for eye or wound irrigation, there is no way you can pack a useful amount as a casual rider not expecting to get into trouble. Just use clean potable water, which you should be carrying anyway. A great way to get (free!) theoretical and hands-on training is to attend a CERT (Community Emergency Response Team) Training Course in your area. It’s simply a two day course with no commitment whatsoever, normally given by Firefighters or other such professionals. If you’re looking for a good, motorcycle-specific, text-book on motorcycle first aid, this is the best starting point I’ve found so far. Needless to say, having the tools does you no good if you don’t have the knowledge to use them. Or enough practice to feel comfortable enough to dare use them. That’s why no one but a professional should even think about putting a decompression needle (that sharp thingy you stick in someones chest for a tension pneumothorax) in their FAK. Likewise, leave the emergency cric airways to the movies. You won’t be poking hollow pens in anyone’s throat. But that still leaves an unfathomable amount of tips and tricks that don’t come on the bottle’s label that you should learn about. Keep in mind that anything you put in your kit and don’t know how to use (or feel confident using) is just taking up wasted space. Doing a CPR course is just a start, but an important one at that. Click here to find a CPR course from the American Red Cross near you. “Theory-only” classes are worthless (except as a refresher), so make sure to find one that includes classroom practice. Besides CPR, hands-on basic First Aid and Emergency Training is also very important. Consider taking a Community Emergency Response Team (CERT) course in your area. They are free, and include both theoretical and hands-on training. It’s a two-day course so you will learn something new, guaranteed. Even more so because they are normally taught by firefighters or other such professionals. It’s definitely a worthwhile experience, and they’ll give you a free backpack and some emergency gear for the effort. Regarding theory, the truth is that you can find better and more diverse information via Google or YouTube than anyone could encompass in a single book. So there isn’t really a need to buy information these days. Nonetheless, it can be quicker to jump-start the learning process with well-organized, accredited information. A great starting point is Blood, Sweat & Gears – Ramblings on Motorcycling and Medicine by Flash Gordon. Not that Flash Gordon, regrettably. 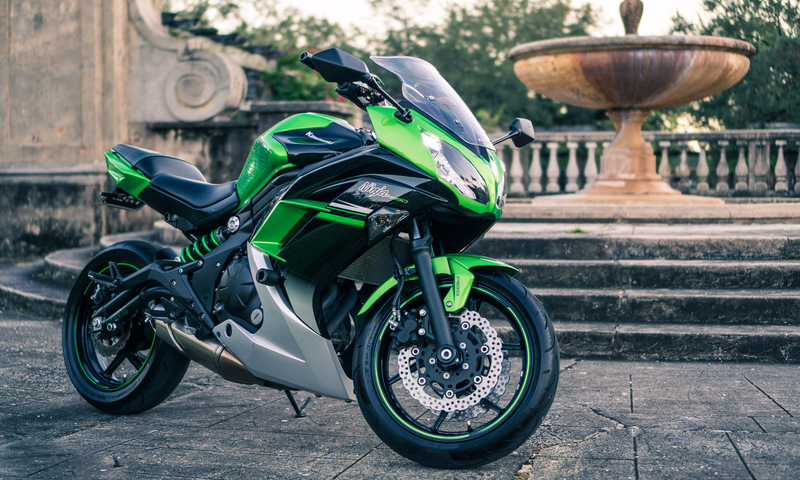 It’s made for motorcyclists, by a motorcyclist, so you’ll find some information there that you won’t find anywhere else. Another, more exhaustive book I like is the AMA Handbook of First Aid and Emergency Care. And finally, another cool option is The Wilderness – First Aid Handbook, because it’s compact and the pages are literally waterproof making it a good option to carry with you on longer trips. The takeaway is that information is easier to come by now then ever before. Just look at what you’re reading right now! Take advantage of it and inform yourself. Someday it could save a life. So you “had to lay ‘er down”, did you? Uh huh. Suuure we believe you. Well, now what? It would be nice to simply say “visit a doctor” after every accident, even if you just low-sided at slow speed on a curve with no “real damage” beside some superficial gear and ego scratches. But in the real world most won’t bother with the hassle and expense of doing so unless it’s blatantly necessary. You can agree or disagree all you want, but it’s what us silly humans do. The question then turns into “How do I know if I really should go to the doctor?” – Well, I’m glad you asked. Thanks again to Flash Gordon’s Book, we have a one page detailed checklist to go over whenever someone falls off a bike. It’s easy to skip or miss things under the adrenaline rush, and on the side of the road is not the moment to start googling things. I really recommend everyone print this out and stuff it under their bikes seat. It could be a lifesaver. I keep this checklist printed out and folded up under the seat next to the bike’s registration. It folds up nicely to fit with my motorcycle registration and other paperwork. On the side of the road after a slip isn’t the moment to start googling these things. With this checklist you’ll at least be able to grasp a general idea of the situation. First download the attached document using the link below. The checklist is intended to be printed on cardstock (thick paper), double-sided (I used an Epson WF-3640 printer) and then cut to size. To print double-sided, print pages 1-2 using Paper & Sizing Handling as “Multiple – 1 by 2”, with the settings as High Quality and normal print paper (even though we’re using cardstock). Then reverse page manually and print pages 3-4. Cut to size. You can either stuff it under the seat, or in a backpack side pocket. Your choice! Putting together a quality motorcycle First Aid Kit, and learning how to use it, is easier and cheaper than ever. There really is no excuse! Hopefully this post serves any reader as inspiration and motivation to finally check this task off their to-do list. And if you already have a First Aid Kit, what do you carry? What would you change? And suggestions? Motorcycle Electrical Repair – Crimp or Solder?